Friday after work I traveled to the West coast of Florida and caught up with my good friends Russell Farrow and his wife, Claudia, of Sweetwater Kayaks in St Petersburg, Florida. We swapped tales of our recent travels and brainstormed about future expeditions over a few beers and dinner. The following morning I hung out with Russell at the shop. Yes, Sweetwater is OPEN for business, having had their grand (re)opening in October. I’m happy to report that business was brisk while I was there. 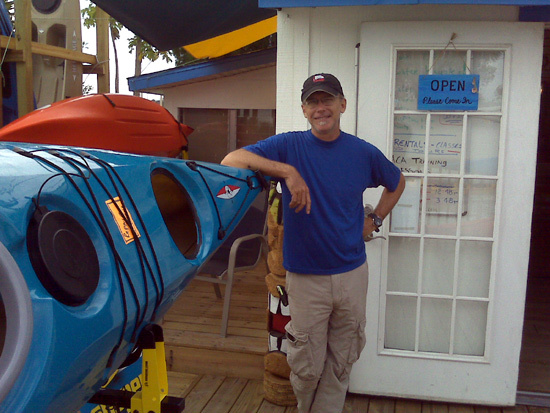 The new shop is close to the original location but is on the water, making instruction and kayak demos very convenient. The new shop, although much smaller than Russell’s previous building, has a great island atmosphere. It reminds me a bit of being in Key West. More good news is that the Sweetwater symposium, that was canceled last year, is ON AGAIN for 2010! Please mark the event on your calendar and support Sweetwater to keep it growing and thriving! I hop the Symposium will be a sucsess!!! Our’s, here in Israel in Optimist Kayk Center- was a great sucsess! Your lessons were a great experience, we exersise ouer self with the greenland stick quiet well! Thank u and hop to see u again next year! Meeting the members of the Optimist kayaking club and teaching in Israel was a terrific experience! It was incredible to be teaching in a harbor on the Mediterranean that was surrounded by marble columns and other relics from the Roman era and before. I look forward to visiting again! I do have some very good images that I plan to post. It is my understanding that Guy M. Robitallie was the head chef at Hidden Valley Ranch and had a hand in the frlumoation of the now world famous dressing. I was told that when they’ sold the rights to Hidden Valley Ranch Dressing, Guy, who is the Montreal born uncle of Luc Robitallie, former NHL hockey player, took his share’ and built’ Robitallie Chocolates at 900 Linden in Carpinteria. He still makes other dressings too.